As the holidays start coming around over the next couple of months, we will all probably end up buying at least a few gifts for friends and family. If you’re anything like me and dislike holiday shopping crowds, you might just end up doing the majority of your shopping online, possibly at Amazon.com. Typically it’s rather difficult to save a decent amount of money when shopping at Amazon because most items don’t qualify through shopping portals, and it’s especially hard to find heavily discounted gift cards. Those two items combined (shopping portals and discount gift cards) often make shopping online at stores such as Staples or Best Buy a better deal, but I still find myself buying a lot at Amazon for either price, convenience (mostly shipping speed), or both. This holiday season, there are several different ways to save money at Amazon if you have the right credit card or get a little creative and I’ll walk you through the top 5 below. This is one of the latest Amex Offers at the time of writing and you should jump on it if you haven’t already! While this one doesn’t have a Twitter hashtag to easily grab it on all of your Amex credit cards, everyone seems to have the offer sitting in their individual cards’ Amex Offers accessible via your regular online Amex account. Enrollment for this offer is limited and there’s a very good chance it will fill up, so add it to your card ASAP (but after reading the next paragraph!). Once added, the offer will be good until 12/31 of this year which gives you plenty of time to maximize it. Typically, adding an offer to one of the Amex cards linked to the same online account will prevent it from showing up for the other cards. This can be worked around by opening each card in a different browser tab/window at the same time, locating the offer on each, then adding the offer on each tab/window one after the other without refreshing any of the pages. This will let you use the offer on every single one of your cards and save a lot more money. If you acted too quickly and already added it to one of your cards, I don’t think there is a way to make it show up again on the others. Keep this simple trick in mind for next time! At $15 off $60, this will save you 25% on Amazon purchases up to $60 times the number of cards you were able to add the offer to. To maximize the savings, buy exactly $60 in gift cards with each card and then add the gift cards to your account. This way, whether your next several purchases are $10 or $500 you’ll still save the maximum amount possible. Every quarter the Chase Freedom card offers 5x earning on a different spending category and Q4 of 2015 includes Amazon.com. Not only that, but Chase has recently updated their offer to 10x on purchases from November 23rd until the end of the year! They are also resetting the $1,500 spending limit on November 23rd, so keep that in mind when trying to maximize the offer, it probably makes sense to wait until November 23rd to start doing your spending. To use the offer, simply activate the Q4 spending bonus and use your card on Amazon (if you already activated the Q4 bonus, this additional offer should activate automatically). If you don’t think you’ll spend the full $1,500 before the end of the year, but want to lock in 10%+ back, simply buy Amazon gift cards which will essentially extend the promotion indefinitely. At a minimum, the 10x rewards are worth an easy 10% cashback, but because the earnings are actually Ultimate Rewards points, the return can be even higher if you have a premium Chase card. By transferring the points earned on the Freedom to a Chase Sapphire Preferred or Chase Ink Plus card, they can then be transferred onward to Hyatt, Southwest, United, and more which will often return an even better value than 1 cent per point. If you don’t currently have a Chase Freedom card, the signup bonus is currently increased to $150 (+$25 for adding an authorized user) after spending $500 in the first 3 months. The offer occasionally goes to $200, but if you can take advantage of the Q4 Amazon bonus ($150+ extra) this is probably the best time for you to sign up. Much like the Chase Freedom, the Discover It card offers 5% back quarterly in different rotating categories AND includes Amazon for their bonus category this quarter. This one isn’t doubled automatically like the new Freedom promotion, BUT Discover has their own promotion going on which doubles all cash back for a year. It was available for existing card members earlier this year for a short period, but is also available to ANY new cardmember. If you managed to activate the offer earlier this year or signed up for a new card when they offered to double all cash for a year, you can effectively get 10% back on Amazon purchases this holiday season simply by paying with your Discover card. If you don’t currently have a Discover It card, the currently signup bonus is $50 which will be doubled because of the “Double All Cash Back Your First Year” promotion to a solid $100 after making your first purchase on the card. The only way to get the signup bonus currently is through Discover’s Refer a Friend program, the public offer currently has no signup bonus. (The referral link still comes with the Double First Year Cash Back promotion as noted in the terms during the application). If you don’t already have a friend with the Discover It to refer you, please use my own referral link below. You will get the $100 mentioned above after your first purchase ($50 now, $50 in a year) and I will also get $100 ($50 now and $50 after my doubled year is up). Any clicks and applications through my link below would be much appreciated! This one involves an extra step, but can be done with ANY credit card and has the potential to save a lot of money if you need gas. To take advantage of this deal, you simply buy Amazon gift cards at a grocery store to use when buying things on Amazon.com. The way this can save you a lot more money than shopping directly is credit card spending bonuses and/or fuel points earned from the purchase. First, buying the Amazon gift cards in the grocery store allows you to take advantage of grocery spending categories on various credit cards. If you have a card like the Blue Cash Preferred (6% back), Blue Cash Everyday (3% back), Amex Everyday Preferred (3-4.5x back), or any other card with a bonus on grocery spending, this would be a great time to use it. Normally, these cards wouldn’t provide a bonus for shopping at Amazon, but by buying gift cards at a grocery store, the spending category can be heavily expanded (this applies well beyond Amazon to any store whose gift cards can be bought at a grocery store). Even if you don’t have a credit card with a bonus category of groceries, using fuel points earned from the purchase can still save a good amount of money. Most grocery stores with fuel rewards programs offer 2x points on 3rd party gift card sales and cap rewards per fill-up at $1 off per gallon. This means a $500 Amazon gift card purchase will earn you a dollar off a gallon (typically capped at 25-35 gallons) the next time you fill up at the gas station. While 2x fuel points is the norm, be on the lookout for multipliers, especially around the holiday season. For example, Kroger branded stores (Kroger, Fred Meyer, QFC, etc.) 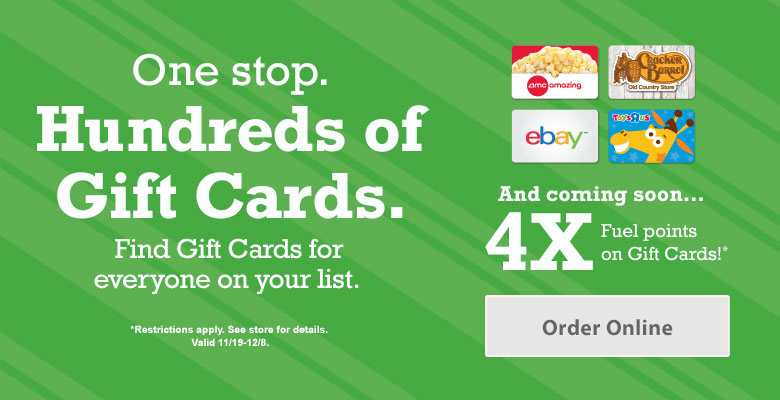 are offering 4x fuel points from Nov 19th to December 8th this year. This means you would only have to buy a $250 Amazon gift card to save the full $1 off per gallon! If you’re going to be spending money at Amazon anyway, there’s no reason not to earn some free fuel points in the process. If you really maximize this opportunity (which works year-round by the way! ), you can save upwards of 20% on any purchase you make on Amazon! That’s up to 6% in credit card rewards in addition to up to 14% back from fuel points during a 4x promotion ($35 saved at the pump on a $250 gift card purchase). If you are an Amazon Prime member, Amazon offers an unlimited 5% back on Amazon purchases credit card. The Amazon Prime Store Card isn’t anything spectacular, but if you shop at Amazon a lot it is definitely worth considering. The card pretty much only works at Amazon.com, but has no annual fee and offers 5% back on all Amazon purchases year round in the form of a statement credit. The signup offer on my Amazon account is a measly $20 Amazon Gift Card upon approval for the card, but I’ve seen it go higher and seems heavily targeted when you are checking out. If you’re spending a decent amount of money at Amazon each year and want a simple way to save 5% while you do it, this might just be the card for you. I won’t be applying for this card because while I do buy a decent amount of stuff at Amazon, I prefer getting higher returns by juggling signup bonuses and constantly churning through new credit cards which consistently yields 10%+ back in travel. I understand this isn’t for everyone though. Did I Miss Any Other Awesome Ways to Save At Amazon? How do you plan to save money this holiday season on Amazon (or anywhere else for that matter)? Instead of doing the multiple browser window trick mentioned in number 1, (I cannot get more than two windows to open without being told I am signed in already), I set up EACH Amex card with its own sign-in thing-ee and use the incognito setting. Same with Twitter. I set up a separate Twitter account for each card so I do not have to load each card and unload each card to my twitter account. Just a thought! Hope your return from Vegas was smooth! For the trick, it sounds like you are trying to create separate sessions by logging in again rather than just using the same session in the same browser for all cards. Unlike some other tricks, it’s NOT necessary to use incognito or multiple browsers at the same time, simply open a new tab for each card in the exact same browser. The easiest way I’ve found is to log in and then right click the “American Express” logo at the top and select “Open Link In New Tab” as many times as you have cards, then go into each tab and pick a unique card, confirm the offer is available on all cards, then click “Add to Card” on each separate tab. Using a unique Amex login for each account will also work as you mentioned, but sounds like way more work and really hard to scale when we start talking on the order of dozens of Amex cards. For Twitter, I agree setting up separate accounts is the best option. I’ve never actually considered swapping cards around in a single account, but it sounds far more tedious because you would have to do it for every offer. My method is to set up a new Twitter account for each card and then link all the accounts under a single Tweetdeck account. This allows me to log into tweetdeck once and get the offer across ALL of my cards with essentially a single tweet. Takes less than 5 minutes and I do it on my phone most of the time as soon as I hear about a new deal. Both of these topics would probably make good individual posts where I could add pictures and go into more detail. Yeah, I tried to do the multiple window thing but something about my system, no matter what I try shows me already logged in after at most 2 windows. Not only that but as soon as I score whatever offer on card 1, it vanishes instantly. Lost out on a couple deal so I gave up on that. It is not like there are SO many deals I can use for my own purposes anyhow. Defeats me every time. I agree, re-doing log ins is a pain with a different one for each card (except my very first two), but it works. I scored major on the Best Buy 20 off 199 thing-ee, for example. The Tweetdeck thing I am *not* familiar with though. I need to learn about that. It took me like 10-15 minutes though is all to do the AIR BNB thing across all my cards so that wasn’t too bad. I have the log out and back in thing kinda down to a science, plus cut and paste the magic words for the day in and off I go. I’ll look into the tweetdeck but look forward to a column about it sometime anyhow. I am always trying to learn more about this stuff! You forgot Barclay’s Sallie Mae 5%. Better than #5 IMHO unless you spend over $750/month at Amazon. The Sallie Mae card used to be my #1 recommendation for people who didn’t want to chase signup bonuses, but unfortunately they aren’t accepting any new applications for the card. That is why I chose to exclude it from this list. As far as I know, if you have the card already the bonus categories are still in tact (Amazon included), but it will be interesting to see how long they last (hopefully a while for those who have it).